Finding happiness may be easier than you think, when you begin practicing the art of appreciation on a regular basis. This is a simple but extremely powerful shift of your mental focus, that will truly amaze you with the results it produces. It is a tool you already have, and now you're going to learn how to use it to your great benefit. I will expand on each of these below, because they all have tremendous importance. Of Finding Happiness Through The Art Of Appreciation? Let's take each one of these benefits and explore them further. Then we'll get to the actual method of finding happiness by practicing the art of appreciation. Raises your value -- In the business world, appreciation means increase in value. The same thing applies here. When you take the time to appreciate yourself, your relationships, and other aspects of your life, they will increase in the value you hold for them. 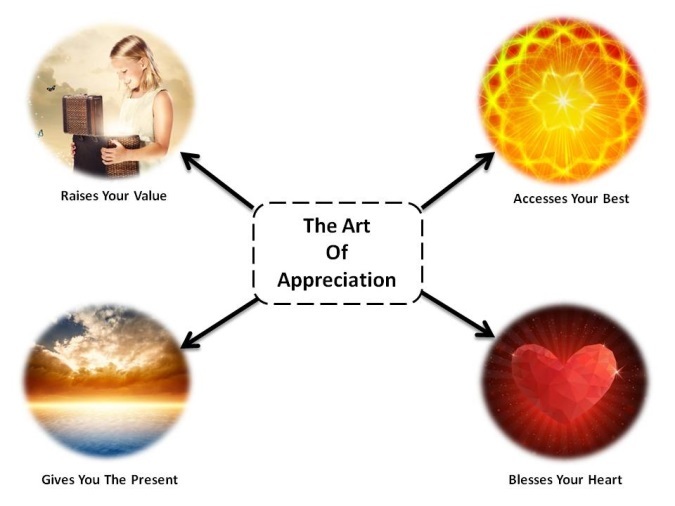 Accesses your best -- This is true because when you are in a mode of appreciation, you are connecting with the core of your being...because you are an appreciator by nature. If you're not sure about this, practice it for a while, and you'll see what I mean. Gives you the present -- You generally will be in the present moment when you're in the act of appreciating something. When your focus is on something that has already happened, it's more of a feeling of gratitude, whereas appreciation is more about focusing on the present. Blesses your heart -- The Institute of HeartMath has done extensive research that demonstrates how your heart benefits when you are expressing love and appreciation. Your heart is always registering your emotional state, and responding in its rhythm and regularity. There is almost no greater gift you could give yourself than to master the art of appreciation. Now it's time to learn the actual method of finding happiness by becoming an appreciator. 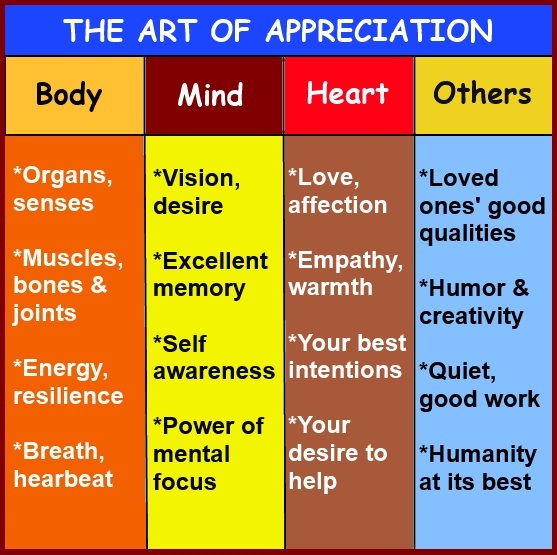 The chart below gives you an overview of what you might spend time appreciating. Remember...the more you do this, the easier it becomes, and the greater you will benefit. Of Finding Happiness Through Appreciation? Your appreciative heart is right there with you, all of the time. And like all of your muscles, the more you use it, the stronger it gets. You will be leading this appreciation process with your mind...specifically, your mental focus. This does require effort. The natural tendency is for your focus to automatically run in the same way it always has, which may take you away from happiness instead of toward it. Most people cannot shift to the habit of finding happiness through the art of appreciation without a structured process of journaling, so that's what we're going to recommend here. As the chart above suggests, you will focus on (at least) these four areas of body, mind, heart and others. Other topics on which to focus your appreciation include nature, success, creativity, art and beauty. Love Life & Life Loves You Back! Find a comfortable, quiet place where you can sit alone for at least 10-15 minutes, ideally in the morning, but any time of day is good. If you like, play some relaxing, pleasurable music and enjoy your favorite warm beverage. 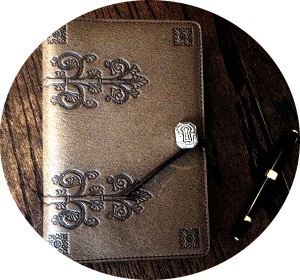 Get a journal or note pad, and begin writing about what you appreciate. Using the topics listed on this page, take them one by one and write about what you appreciate on each topic. Use the wording, "I appreciate..." or "I love..." to start each new sentence, instead of just making a list. Don't worry about repeating yourself -- repeating is a very good idea, especially when it comes to appreciating your body, mind and loved ones. Do this journaling process daily for 21 days (the time it takes to create a habit), and then 3-4 times a week thereafter. Ideally, you will do this as a part of your Goodfinding journaling process, which includes finding happiness with gratitude and optimism along with your appreciation. Do this until it becomes automatic, and then keep doing it as a way of keeping your energy up and your spirits high. Learn more in this article called, Two Key Steps To Finding Happiness.